We have written several articles about the 3Rs, Reduce Reuse Recycle and we have given several Reduce Reuse Recycle facts. In this article we will give an example of the 3Rs concept. We will give practical examples of how to Reduce Reuse and Recycle Wine Corks! Most dinner and a lunch outings all over the world as associated with wine. Wine in most part of the world is stored and sold in bottles and corks are used as wine stoppers, preserving the wine in the bottle. Good wine corks are extracted from Oak trees known as cork Oaks and they are expensive. Once we open and consume a nice wine we are left with an empty bottle and a cork. Immediately we are faced with the two of 3Rs options: to Reuse and Recycle. We can reduce and recycle both the glass bottle and the cork. In this article we deal with the reuse and recycling of wine corks. The importance of the 3Rs concept is well known to all and it is certainly a way to: save natural resources and conserve energy. Recycling and reusing glass will be dealt in another article. You will be surprised of how many amazing and useful things can be made by reusing wine corks. Below we will give a list and a short description of handy and useful things and staff made from corks. Wine glass charms: If you have a lot of corks it means that you are wine drinker or you have wine parties. You can use corks to make wine glass charms so that your friends will identify their wine glass. Knife Holder: Take corks, glue them together, make slits in the top and then put store the knives with the blade down in the cork slits. This makes the knives safe and at the same time keeps them sharper for a longer time. Knife Cleaner: You may use the cork and a dash of cleanser to clean your high-carbon knives. Anti-scratch pads: You may cut the cork in small disks and stick them at the bottom of furniture, chairs and tables so that you will avoid scratching your wooden floor. 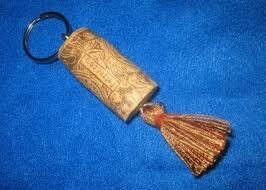 Cat toy: Champaign corks become great cat toys by attaching a string to the cork and giving it to the cat to play! Bird Toy: Birds like parrots have the need to shred. You can use corks for this purpose and give your birds more fun and pleasure. Cork Board: You can make your own cork notice board by using the corks in a frame. 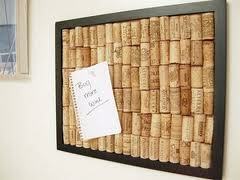 The cork board can be used in your kitchen or your office. Garden Mulch: After cutting your corks in small pieces or passing them through a food processor or a blender the corks can be placed in the garden bed. They retain the moisture around the plants and mulch the garden. Stamps: You can carve the one end of the cork in various shapes and letters, and by using ink you turn the cork into a cork stamp! This is useful as a child’s toy. Place holder: You can use corks as place holders by making a slit along the cork, lengthwise, and putting a name tag in it. Fire Starter: You can use one or two corks to start the fire in your fireplace by dipping them in rubbing alcohol and then placing them in the fireplace under the firewood and lighting them up. Cork Trivet: You can easily make a cork trivet by buying a picture frame and gluing the corks in the frame. You always need an extra trivet to be available and handy. Cork Wreath: If you have a lot of wine corks you can create a wine wreath and hang it outside your door. During the Xmas period you can use Xmas LED lights and make it more impressive. Handles: You can upgrade or renovate your old cheese knives by replacing the handles with wine corks! Serving Tray: You can easily create a serving tray using your old wine corks. Herb garden markers: You can use your wine corks as herb garden markers to easily identify your herbs. Drawer pulls: You can use champagne corks as drawer pulls. You can even color them to give color to your furniture! Bath mat: You can create a nice bath mat to use in home personal bath. Key chains: You may use corks to make key chains and add names on them! This would be something different and identify you as a wine lover! Wine corks can be recycled along with the wine bottle. They can however be recycled separately and be transformed into any of the following: Floor tiles, Insulation, crafts material and any other useful equipment or tool. Wine corks can be recycled at specialized recycling wine cork centers. In USA there are 4 different organisations which take corks for recycling. These are: Yemm & hart Ltd, Korks 4 kids and Terracycle. These companies have programs which even pay you to send them corks for recycling so you can actually make some money by collecting and recycling wine corks or you may donate the corks to various charity institutions and give them the chance to collect money for their charities.